This bike highway connects Delft with Rotterdam, mostly following the old main road between the two cities before the A13 motorway was constructed. It begins near the TU Delft campus on the south side of Delft and follows Rotterdamseweg. It stays parallel with the road as a two way cycle track and also follows the course of the Delftse Schie canal for almost 5 km. Approximately halfway to Rotterdam, the cycle track ends and the bike highway follows Rotterdamseweg (which later becomes Delftweg) as a bike boulevard through the village of Zweth. 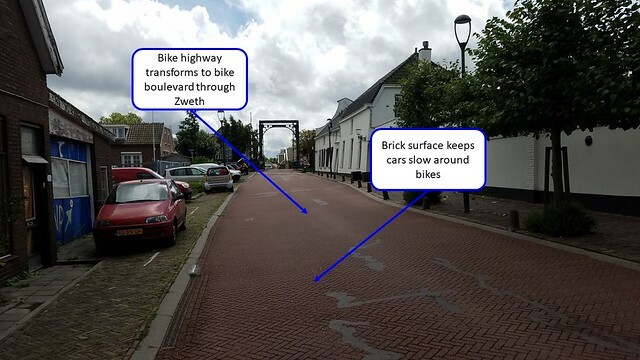 Once outside of Zweth, the bike boulevard becomes a road with advisory bike lanes for a little over 300 m, before becoming a two way cycle track once again. The cycle track stays parallel with Delftweg and the Delftse Schie canal for another 1.3 km before once again becoming a road with advisory bike lanes. These advisory lanes continue for another 1.2 km, terminating at the bridge entering the village of Overschie. Through this village, the bike highway is a bike boulevard, before turning onto Delfshavensweg as a bike boulevard. This concurrency only continues for about 200 m before the bike highway transitions to a fully separated bike path. The path runs parallel to Delfshavense Schie canal, passing under Rotterdam’s ring road. A bridge was added across the Schie-Schiekanaal to complete the link between Delft and Rotterdam. Aelbrechtskade joins the bike highway, and the highway is concurrent with the road as a cycle track. As it gets closer to the center of the city, signalized crossings occur at Nieuwe Binnenweg, Heemraadssingel/Pieter de Hoochbrug, and both direction of the S114 road. The highway finally follows a short concurrency with the S103 highway to the Maastunnel before terminating near the Euromast in downtown Rotterdam. The highway takes every effort to minimize stops for cyclists by prioritizing bikes at most crossings, or isolating bikes from crossings altogether. The highway has priority at every intersection in Delft. The first large road the highway intersects is the N470 on the south side of Delft, which is avoided by a grade separated crossing by crossing over the bike highway and canal. This bike highway can be divided into two sections: rural and urban stretches. The rural stretch follows Rotterdamseweg/Delftweg to Overschie while the urban section follows Delfshavensche Schie from Overschie to Rotterdam (see map above). Throughout the course of the rural stretch, the highway is a cycle track along the canal and Rotterdamseweg. The highway is paved with smooth asphalt, rather than brick, which balances comfort with the ability to gain high speed. The fact that only a few streets with very little traffic intersect the bike highway compounds this ability to reach high speed on long, uninterrupted stretches. Even at these infrequent crossings, the bikes get priority. Along the rural section, the bike highway is not directly lit, but gets indirect light from the streetlights along Rotterdamseweg. In the villages of Zweth and Overschie, the tracks end and the bikes are integrated on the local streets as bike boulevards.To alert both cars and bikes that they are approaching towns, the road surface changes to brick and the speed limit drops, making it suitable for bikes and cars to share the road. Between the villages, advisory bike lanes are used. There may have been enough room to maintain the cycle track, but the lanes may have been added along with the brick road surface to keep cars slow not only in the villages, but between the villages and encourage high speed travel on the A13 motorway. Once the bike highway turns off Overschieseweg/Delftweg, it enters the urban stretch of its route. The path now is lined with streetlights and the area becomes more built up and urbanized. For the rest of its route to the Euromast, the bike highway is a fully separated cycle track. The roads in Rotterdam are wider than the roads in Delft as well as Delftweg, with higher traffic counts. The cycle track keeps cyclists safe and makes it easier to give them priority at intersections, as they have their own right of way/ path. The track was also placed on the canal side of Aelbrechtskade to minimize the opportunities for cars and bikes to intersect. This not only keeps bicycles safer, but allows for less interruptions to the route, which allows bikes to go faster over longer distances. The bridge over Schie-Schiekanaal is an important link in the bike highway, as it is the most direct link between Delft and Rotterdam. If this bridge was not built, cyclists would have to take a detour towards Rotterdam and Overschie, needing to find ways around the A20 and possibly A13 motorways. This bridge is the link that completes the 14 km route between Delft and Rotterdam. For the most part, the bike highway was well marked and easy to follow. Along Rotterdamseweg, there were minimal bike specific markings. The highway followed that route from Delft to Overschie with very few cross streets. As a result, it was unnecessary to have many signs marking direction as Rotterdamseweg was the only street to follow. The one intersection that did require signage was an intersection with another bike path just north of Zweth. At the intersection, the sign is very clear about what destinations are in which direction and their respective distances. It gives an extensive representation of your location and how far you are from the next town(s). At certain intersections (including this one), there were also maps to show your location in relation to the path system as a whole. While the northern part of the path was well marked and was easy to find the route’s continuation, the turn at Overschie had no signage for the bike highway’s route continuation. There was a sign directing cyclists to certain destinations, but gave no indication of which path to follow or how long to follow it to get to the center of Rotterdam. I looked up this turn on Google Maps in advance, as other people had told me about the risk of missing this turn and as a result, did not get lost. However, this lack of direction would be problematic to other cyclists who did not know the directions. In addition, this turn is not only unmarked but also misleading.The road that continues straight over the drawbridge (see picture) is visibly wider than the correct route, giving cyclists a possible assumption that the correct route is straight rather than left. Once on the urban section, finding the end is much easier and again does not need signs. The bike highway is known to end at the Maastunnel which is at the base of the Euromast. Since this is a tall landmark tower, following the highway eventually becomes visual. This bicycle highway was planned along an intentionally scenic route and quiet street to minimize the stress while riding. Rotterdamseweg had traffic meters to limit the amount of cars that travelled along certain stretches in certain windows of time. This made the street much quieter and more pleasant to ride, as cars were dissuaded from taking this route instead of the motorway. This route also had few houses or businesses due to the abundance of farmland on one side of the road and a canal on the other. South of Zweth, trees were added to isolate the bike highway from Delftweg and to further quiet the path. Closer to Rotterdam, the surroundings were more heavily urbanized, but the cycle track was still isolated from the adjacent commotion. It was placed next to the canal to not only minimize crossings from side streets, but to create a more scenic atmosphere, along with the intermittent green space and strategically planted trees to create a green oasis in the center of the city. The Rotterdam-Delft bike superhighway is an ideal link to connect two important cities in the Rotterdam-Den Haag Metropolitan Area. Most of the route is well marked and provides clear direction between Delft and Rotterdam. The route is also smooth and relatively straight, with few crossings or interruptions, giving cyclists a chance to gain higher speed and waste less energy getting back up to speed. Overall, this 14 km bike highway is a suitable, free alternative to taking the train between the two cities if a cyclists has the time.